The New Year is just four days old but there’s a realistic expectation that novel technologies to assist clinicians in treating breast cancer may soon emerge. Such optimism is indeed well placed with the recent announcement of two diagnostic tools that operate in real time, one intended for use during biopsies, the other during surgery. Photomicrograph of a microcalcification associated with breast cancer. Copyright MIT News. One of the telltale signs of breast cancer is a pattern of tiny calcium deposits that are identified by the radiologist from the mammogram. These microcalcifications form when calcium from the bloodstream is deposited onto degraded proteins, and the radiologist then performs a needle biopsy to remove samples of tissue containing the small deposits. In up to 25% of biopsies, however, the doctors fail to retrieve tissue that contains calcifications and this leads to an inconclusive diagnosis. A group of researchers from Boston and Cleveland have just published a paper in the Proceedings of the National Academy of Sciences in which they presented a novel technique called diffuse reflectance spectroscopy. Their system works by sending light via a thin fibre optic probe into the tissue of interest, then capturing and analyzing the light spectrum after its interaction with the tissue. By studying the resulting spectral “signature”, the clinicians can tell, with 97% success and within a few seconds, whether they are about to biopsy an area that includes the microcalcifications. Potentially, their findings could lead to the creation of a relatively inexpensive tool that may have a significant impact on breast cancer diagnosis. 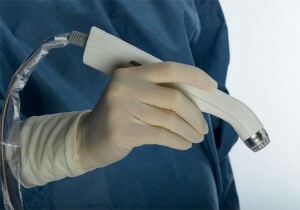 The MarginProbe for intra-operative cancer detection. Copyright Dune Medical Devices. One of the challenges faced by a surgeon when performing a breast-conserving lumpectomy (as opposed to a mastectomy) is that she may not know whether all of the cancer has been removed. As breast surgeon Dr Susan Boolbol has stated, “Following her breast cancer surgery, telling a patient that she needs more surgery can be an emotional issue for both doctor and patient, resulting in tremendous anxiety and frustration”. Dune Medical Devices has just announced that its MarginProbe system has received premarket approval by the Food and Drug Administration (FDA) in the USA. FDA approval was based on a multi-centre clinical trial of 664 patients and demonstrated that MarginProbe was three times more effective in finding cancer “on the margin” during lumpectomy compared to intra-operative imaging and palpation. This tool uses electromagnetic “signatures” to distinguish between healthy and cancerous tissue and shows great potential to improve patient outcome. Sigh. 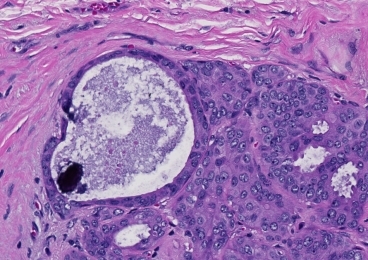 If only the microscopic cancer obediently stayed where the microcalcifications were, and the calcifications were a tight ring fence marker. Thanks for this insight, David. I realise that we need the experience of a breast surgeon like you to provide some perspective on this issue.